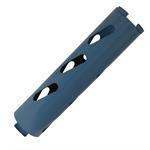 Dry cutting diamond core bits drill neat quick holes in masonry, brick and block. No water is required to cool the bits so setup time and clean up are minimized. These air-cooled bits will not spawl the concrete and drill holes faster than other methods. Dry cutting core bits operate best when used with an angle grinder, but will also work with any rotary drill. Adapters for use with rotary drills are available.